Jane Castleman, leader of the Golden Needles sewing group, passed away March 23, 2017 at her home. Jane was a dedicated member of MCBC, a hardworking leader of the Golden Needles, church nursery, and seniors program. She will be missed by everyone at MCBC and everyone who knew and loved her. Please keep her sister, Helene Taylor, (also a member of MCBC), her daughters, and all her relatives and loved ones in your prayers. Special thanks to Sandy Jones for stepping up to run the Golden Needles so this vital program continues. A group of ladies from Dunlap, Tennessee, known as Sewing for Vets, saw some information in the Chattanooga newspaper about Middle Cross Baptist Church’s own Golden Needles Sewing Group and called Jane Castleman to see if they could come see our set-up. Ernestine Pilkington, leader of the group, Soni Connelly, Jerry Carr, Jackie Smith, Gayln Hayes, and Valerie Seguda visited the Golden Needles group Thursday, March 16, 2017. After seeing all the things the Golden Needles make, the Dunlap group took a neck pillow pattern, an adult bib pattern, and walker caddy pattern back with them so that they can begin making these items. The Golden Needles group is blessed with a permanent room in the Family Life Center that has sewing machines, thread, needles, patterns, as well as numerous shelves to hold all the material. The church also provides a budget for the group’s needs. In addition, they have use of large tables in another section of the facility to cut out and pin on patterns, iron, and stuff heart-shaped pillows. Unfortunately, the Sewing for Vets group has no permanent set-up. Ernestine has a storage building in her back yard where she stores their supplies. Every other Thursday the ladies load up the sewing machines, serger, material, needles, scissors, thread, and anything else they need and carry it to the Sequatchie Farmer’s Co-Op building to do their projects. When they are finished for the day, they load everything back up in their cars and return it all to Ernestine’s back yard. Unlike the Golden Needles group, the Sewing for Vets group has never had any material or any other items donated to them. The group holds yard sales two-to-three times a year and the proceeds go to purchasing anything needed for their projects. The Sewing for Vets got started when Ernestine met a lady in Pikeville who made some of the things they now make. She didn’t want to drive to Pikeville every two weeks, so she began asking friends if they wanted to help with the project. They now have 8-9 people in the group. They give their handmade items to the Veterans Hospital in Murfreesboro and to other needy groups. Sewiig for Vets with the Golden Needles sewers. Sewing for Vets and Golden Needles together. Helene Taylor and Lucky Bynum explains pillows for breast cancer patients. Sewing for Vets group visited from Dunlap. Jane talks about the many projects the Golden Needles provide. Sewing for Vets make aprons to help with learning to reuse their hands. Sewing for Vets make shawls with hand warmer pockets. Carrier make from camo material. Lauren St. Germain, NewsChannel 9 weekend anchor of Good Morning Chattanooga, featured Middle Cross Baptist Church's Golden Needles Sewing Group on her Pay It Forward segment a few weeks back (scroll down after this story). At that time she asked if she could come back in October to feature the work they do for the Mary Ellen Locher Breast Cancer Center during National Breast Cancer Awareness month. She returned to our church Thursday, October 20 to film the new feature. Her story explained how the process works to make the heart-shaped pillows need when a woman is recovering from mascetomies or some biopsies. First the Golden Needles group irons the material used for the pillows. Then the material is passed on to the ladies who cut out the pattern, then given to the seamstresses who sew the pattern together (leaving a small opening) so the ladies in the next step stuff the patterns and then hand stitch the opening closed. Then the pillows are ready to be deliverd to the MEL Breast Cancer Center. Wanda Scott starts the process of making heart-shaped pillows by ironing the material. Wanda moves to the table to begin cutting out the patterns for the pillows. Most of the ladies who sew are volunteers outside our church family. We had four ladies sewing on this day. Recently cut patterns moved to the sewing machines for the ladies to sew. This group stuffs the pillows and then hand-stitches the opening together. Arriving at Memorial to deliver the pillows. Dr. Maurice Rawlings thanks the Golden Needles for their support of the Mary Ellen Locher Breast Center. Dr. Rawlings being interviewed by Lauren St. Germaine, as the Golden Needles group looks on. Virginia Horn, who has been attending our church for a while donated five afghans she crocheted to the Golden Needles. Virginia, who is a caregiver for some of her family members, says, "It takes me about three weeks to complete an afghan." She learned about the Golden Needles when they were featured on News Channel 9's "Pay it Forward" segment recently. "I asked Jane if she could use some afghans," says Virginia. "And, she assured me they would be put to good use at local nursing homes." Jane says the nursing homes will be thrilled to get them. Virginia hopes to join the Golden Needles any time she is not taking care of her family. Once upon a time ... No, wait, it's not a fairy tale! Since Lauren St.Germain with News Channel 9’s “Play it Forward” honored Middle Cross Baptist Church’s Golden Needles on a recent segment, great things continue for the group as they provide blessings and hand-make goods to local VA centers and hospitals, the homeless, local nursing homes, as well as the Mary Ellen Locher Breast Center. Betty Crabtree, who had seen the segment on Channel 9 of the Golden Needles and had contacted the group via their Facebook page, came by the meeting and donated some material to the group and joined the group as a sewer. Nancy Wiley, surprised the group by dropping off a trunk load and back seat load of material. Donna Holcomb, who also saw the Pay it Forward segment dropped in on the Golden Needles. She explained that she had breast cancer surgery in 2014. She had received one of the heart-shaped pillows and a drainage tube belts after her surgery. Even though they were not made by our church, she says, “I was so impressed with the news coverage, and I see all the good your group is doing, and am here to make a donation to the Golden Needles.” She also expressed interest in joining the group “Even though I can’t sew, I could cut out patterns, etc.” Before she left the church she made a $100 donation to the Golden Needles cause. Before the Golden Needles meeting ended another lady stopped in to the Family Life Center with more material and batting for the group. She said she was moving and thought the group could use the material. She left as quickly as she came and only gave her first name, Beth. Thanks to everyone for their donations and interest in the Golden Needles group. Anyone who would like to join the group or donate cotton material, etc., come by the Family Life Center on the first and third Thursday of each month from 10 a.m. to noon. For more information call the church at 423-877-5742. On Thursday, August 4, 2016 News Channel 9 and the McMahan Law Firm came to Middle Cross Baptist Church to "Pay it Forward" to the Golden Needles Sewing Group. Associate Pastor Eddie Womack presented the $500 to the surprised group of ladies with the Golden Needles. They were nominated for this honor by church member Paula Bean. Bro. Eddie was interviewed in the sanctuary at the church by Lauren St. German, Anchor/Reporter at News Channel 9. After his interview, Bro. Eddie, Lauren St. Germain, and her photographer sneaked inside the Family Life Center where the Golden Needles meet on the first and third Thursday each month. A surprised group of ladies were taped making heart-shaped pillow that are distributed to the Mary Ellen Locher Breast Center at Memorial Hospital. Read this whole page down to the bottom of the page to see a list of what sewn goods they make and where they distribute the things they make. Bro. Eddie Womack with Lauren St. Germain. Camera person checking the tape and sound. Jane Castleman was totally surprised when the news crew showed up. Bro. Eddie counting out the $500 to Sandy Jones and Jane Castleman. Lucky Bynum and Helene Taylor work as Jane Castleman and Lauren St. Germain look on. Some of the Golden Needles include Louise Womack, Wanda Scott, Helene Taylor, Lucky Bynum, Jane Castleman, and Sandy Jones. The "Pay it Forward" segment on the Golden Needles aires August 8. Lauren St. Germain asking questions about the Golden Needles. Jane Castleman and Sandy Jones point out the bulletin board where photos of the group and thank you letters are posted. Bulletin board in the sewing room in the Family Life Center. Lauren St. Germain with News Channel 9 in the Golden Needles sewing room. Sandy Jones sewing one of the neck pillows while being taped. In 2009 Tootsie Whitehead, former member of Middle Cross Baptist Church, started the Golden Needles Sewing Group at our church. After Tootsie moved away, Jane Castleman and Sandy Jones took over as leaders of the sewing group. The Golden Needles sewing group consists of our church members and others from outside the church who have a calling to help those in need by participating in our sewing ministry. They make lap robes, bibs, caps, neck pillows, and walker caddies. They also make caps and wool scarves for the homeless. The completed items are taken to nursing homes, VA hospitals and clinics, or for anyone who needs them. The Golden Needles also make heart-shaped pillows, hats, and drainage tube belts for the Mary Ellen Locher Breast Center at Memorial Hospital. Last winter, the group heard of a need that local, mostly homeless veterans were in need of white tube socks. The Golden Needles group shared the need with the Middle Cross Baptist Church’s Sunday school classes who collected and delivered 90 pairs of white tube socks and delivered them to our local VA clinics. We will be doing this again very soon. This group of ladies (no men have joined thus far … but they are more than welcome to participate) sew, cut out patterns, iron, and sweep-up. You need not know how to sew to come help this group help others. Feel free to come join the group or you can donate cotton material for the group. The group meets the first and third Thursday of each month from 10 a.m. until Noon in the Family Life Center at the church. The youngest member of the group was a 9-year-old who was one of the sewers. There are usually 8-9 ladies who meet twice monthly. This photo from a couple of years ago shows Sandy Jones, Jane Castleman, Luckty Bynum, Marilyn Bowman, Connie Parham, Sue Smith, Sharon Garrett, and Louise Womack ready to deliver to local nursing homes and VA clinics/hospitals. Sandy, Jane, and Louise wearing hats they made while loading their vehicle to deliver their sewn goods. 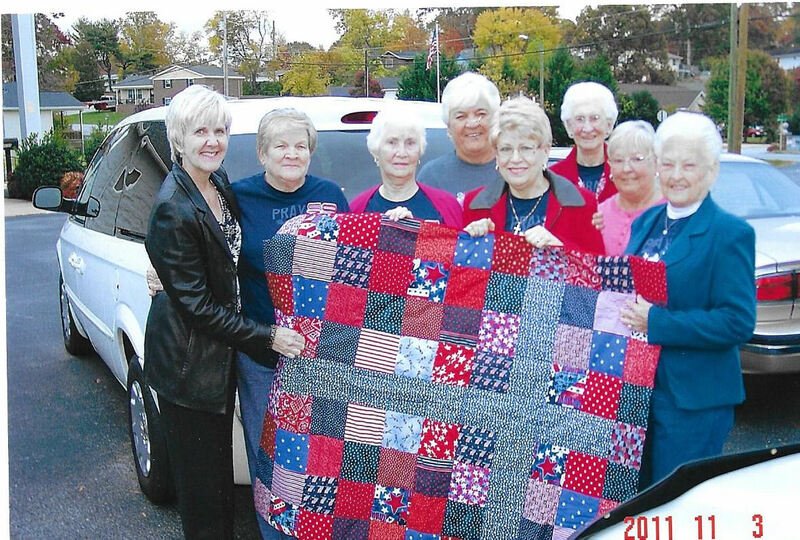 Last year six members of the Golden Needles sewing group delivered more than 20 lap blankets, 12 walker saddle bags/caddies, and 14 hats to be distributed to veterans in Dunlap, TN. Shown, left to right, are Sue Smith, Jane Castleman, Connie Parham, Lucky Bynum, Sandy Jones, and Louise Womack. On behalf of the patients and staff of the Tennessee Valley Healthcare System, Chattanooga VA Outpatient Clinic, we would like to thank you for taking the time to provide 90 pair of white cotton socks on Monday February 22, 2016. Many of our Veterans depend on support such as yours for the everyday comforts so many of us take for granted. Your selfless contribution serves as a invaluable symbol to our Veterans, showing they have not been forgotten. The coalition between the VA and our stakeholders is vital to the continued effort of caring for our nation's heroes. We deeply appreciate your loyalty to our veterans, and hope to hear from you again in the future.